If a new subscriber still hasn’t made a purchase following a welcome campaign, you can send a follow-up email encouraging them to return to your site and “take another look”. Lead activation emails usually include a discount or offer, to encourage a prospect to make their first purchase. Pre-header: The preheader is optimised, communicating to a lead that the brand offers “fast shipping” and “easy returns” (this header is used in all of Finery’s lifecycle emails). Heading: “Nothing to lose” reinforces the email’s offer (£15 off) and is likely to quell any lingering doubts about making a purchase. Email copy: Using first name and lifecycle stage personalisation, the email copy has a witty, friendly tone. 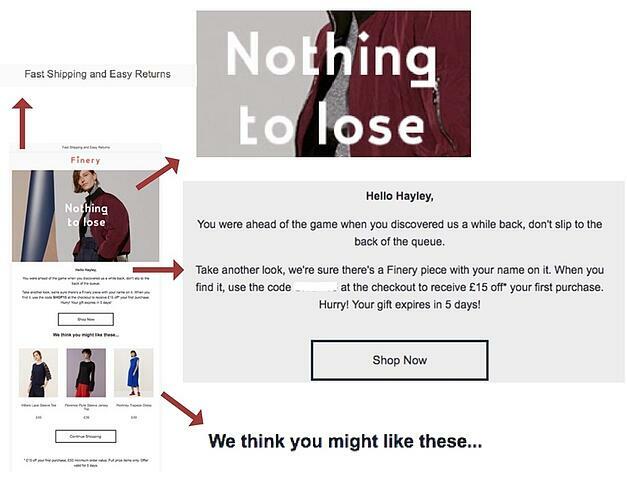 Product recommendations: The email’s product recommendations (under “we think you might like these”) are likely to be based on either their behavioural activity (e.g. products browsed on-site), or something more generic, such as products trending on the site. Once a customer has actually made a purchase, they’ll receive a transactional email(s) straight away (such as order confirmation, payment details etc. 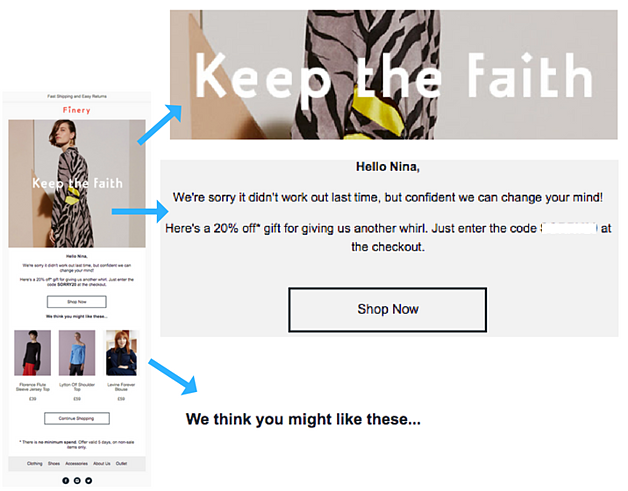 ), but it’s also a good idea to send a post-purchase email 2-4 weeks later. Heading: The phrase “Do stop by”, accompanied by a model looking happy and relaxed, reminds a new Finery customer that they are always welcome on the store. Email copy: By letting the recipient know the brand “can see” she enjoyed herself on its site last time, and offering the news that “lots of gorgeous new pieces” have recently arrived, it makes an active customer feel special and appreciated, and is likely to encourage them to “take a look around” at the new items. 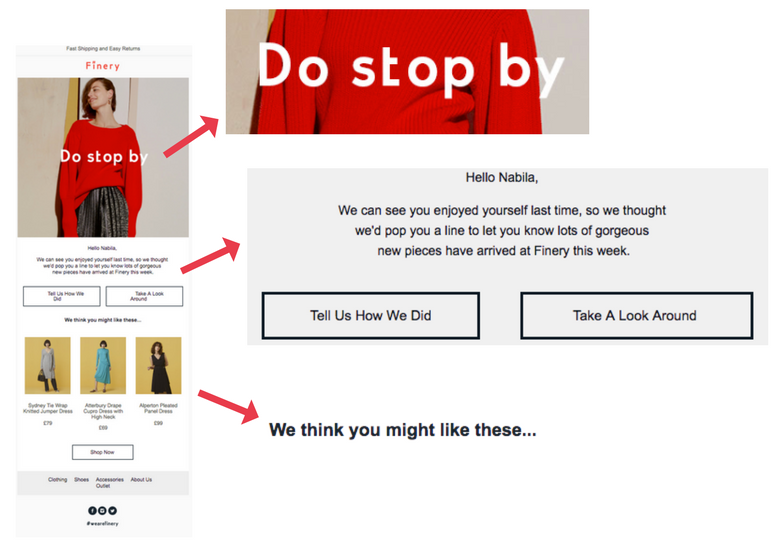 Feedback: As discussed in our blog post on post first purchase emails, you should always ask new (and existing) customers for feedback in order to keep improving your brand’s product and customer experience. CTAs: Both of the CTAs in this email (“Tell Us How We Did” and “Take A Look Around”) are more colourful and interesting than the standard “Give Feedback” or “View Items”, and therefore more likely to see a click through. Product recommendations: For a post-purchase email, ecommerce marketers can use a product recommendation engine to recommend items based on the product purchased; this could be based on the item itself, category or price-point. Likewise, if a customer has visited your website since making a purchase but not bought anything, the recommendations could be based on the items browsed. Heading: The heading, “it’s been a while”, comes across as laid-back and friendly in conjunction with the modest hero image, which is a model wearing a lovely dress shying away from the camera. 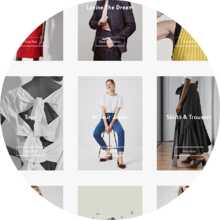 Email copy: This subtle approach is also used in the copy of the email, which adopts a relaxed, friendly tone that makes the message (to let the customer know new pieces have arrived) come across as helpful rather than sale-sy. 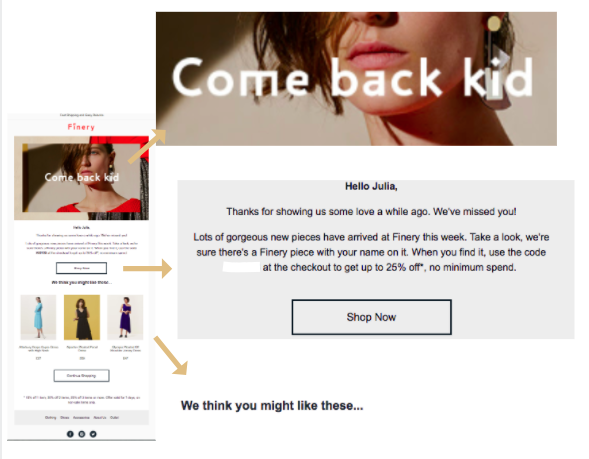 Incentive: To incentivise them back to the site, Finery offers the recipient a discount code to use, and once again includes clear instructions on how they can use it. Product recommendations: The product recommendations in this email are likely to be based on either the new gorgeous pieces mentioned in the copy, or any interaction data available (if that customer has been on the site since their last purchase). B) Reactivation for those who bought an item, returned it, and haven’t purchased anything else in the expected amount of time. Heading: If a customer has to return an item to your brand and hasn’t shopped since, your main concern will be that they’ve potentially been put off from their experience. That’s why a reactivation email specifically for those who have returned an item is so important. The heading “keep the faith” is perfect for this lifecycle stage, as the aim is to encourage the recipient to give your brand another shot. Email copy: Finery wisely keeps the copy upbeat and to-the-point, candidly apologising that the last order didn’t work out. Incentive: This type of customer is likely to need an incentive to get them shopping again, so the brand offers a discount for the customer to “give them another whirl”. You’ve got at-risk, and then you’ve got lapsed - customers who have not shopped with you in over the expected timeframe and have, for whatever reason, clearly checked out. Again, who your brand considers ‘lapsed’ will depend on your business and can be calculated using OGA; but targeting those who haven’t shopped in 12+ months is usually a good benchmark. Subject line: This email may fall on deaf ears, so it’s important the subject line stands out in a crowded email box. The bold CTA, “Don’t be a stranger”, followed by a tempting discount, speaks directly to the recipient and is likely to stir their curiosity. Heading: The striking image, of the model gazing into the distance, and the quirky, double entendre headline “Come back kid” also packs a punch. Email copy: If you’re reaching out to a lapsed customer, it’s worth pulling out all the stops in your email copy to try and get them on board. Use emotive copy, tell them you miss them, offer them a cracking discount - whatever it takes to keep them interested. 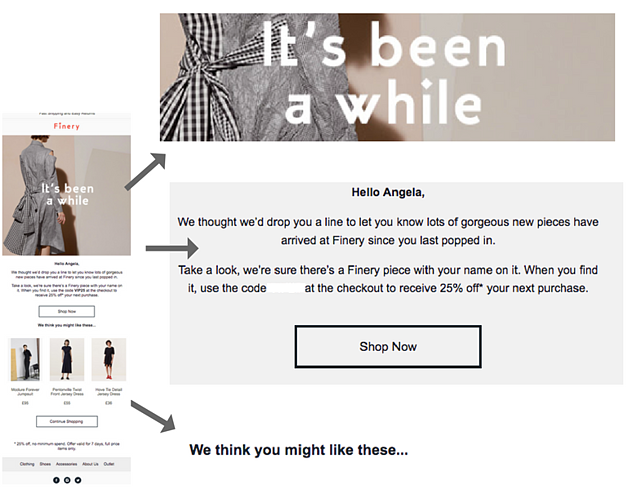 This blog post focuses on email, but when it comes to lifecycle marketing Finery is paving the way for a customer experience that transcends all marketing channels to deliver a truly bespoke customer experience.